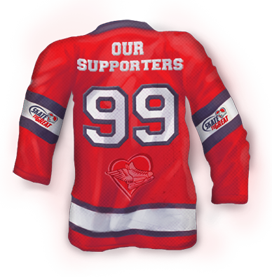 Skate To Great is 100% run by volunteers and we are always seeking help to further our organization. Volunteers take on tasks such as marketing, skate sorting, fundraising, event organization and even accounting. Bring what you do best to our organization! Set your own hours and communicate with other volunteers using our online portal. If you're interested, please contact us with what you would bring to our volunteer team. FedEx Express Canada has supported Skate To Great since day one. FedEx graciously provides shipping services, resources, and funding enabling Skate To Great to assist kids skating and hockey programs throughout Canada. Play It Again Sports supports Skate to Great in the collection of skates and equipment across Canada. When a donation is made at one of the numerous participating Play It Again Sports locations, Skate to Great receives store credit for the value of the donation. This mutually beneficial partnership allows Skate To Great to purchase helmets, laces, sticks and particular sized skates which overcomes a major hurdle for Skate To Great. Not having access to particular sizes and accessories has been problematic for Skate To Great prior to this relationship. StorageMart collects skates at selected locations across Canada. They provide Skate To Great storage facilities for skates and equipment prior to being sent to programs, communities, schools and charities throughout Canada. StorageMart has also selected Skate To Great to be a recipient of their StorageMart Cares program. Unfortunately, some of the equipment that is donated is in poor condition and is unable to be used. As garbage disposal is not a priority expense for the Skate to Great team, 1-800-GOT-JUNK handles it on our behalf. We greatly appreciate 1-800-GOT-JUNK for taking care of the equipment that can’t be used and we invite you to ensure that equipment donated is in usable condition. Skywords has generously donated commercial airtime on various radio stations across Canada, promoting Skate To Great.